1931 Michael Meschke was born on 14 July in Danzig in Germany (now Gdansk in Poland). His father was a priest and his mother a Church musician. He spent his childhood in the village of Schillersdorf by the River Oder. 1939 The Meschke family, forced to leave Germany because of their mother's Jewish descent, emigrated to Sweden. Michael's parents became teachers at the Viggbyholm school, famous for its pioneering use of liberal teaching methods and for nurturing its pupils' individual gifts. Viggbyholm's ceramics teacher, sculptor Einar Luterkort, encouraged Michael to put on his first marionette performance. Michael's classmates acted as his puppeteers. When, after the war, it was again possible to travel, Michael hitch-hiked around Europe. 1951 Meschke took his high-school certificate and began his theatre studies: string puppet theatre with Harro Siegel in Braunschweig, Germany; mime with Etienne Decroux in Paris; directing in Avignon and Salzburg. 1953 Michael Meschke started to establish himself in Stockholm. He founded the travelling theatre company „Marionetteatern Michael Meschke" and created a number of performances, including Baptiste, Beppo the Clown, Nocturne I and II, A Soldier's Tale, A Christmas Play and La boîte à joujoux. He did this without a stage or an ensemble, performing solo or with an assistant in youth centres, libraries and schools. 1958 The Marionetteatern was founded with Michael Meschke as Theatre Director and Artistic Director. He occupied both positions until 1999. His first production was The Heavenly Play by Rune Lindström and his last was The Apocalypse. For forty years he worked as a theatre-manager, puppet-maker, puppeteer, director, writer and teacher. Meschke developed the theatre's repertoire, typically by adapting the works of great writers from Sophocles to Brecht. On the way he took in Aeschylus, Euripides, Dante Alighieri, Cervantes, Büchner, Giraudoux, Strindberg, Boris Vian, Jarry, Neruda, Saint-Exupéry and P.C. Jersild. 1967 As administrator, Meschke made possible the creation of the Cullberg Ballet. 1973 Michael Meschke created the Marionettmuseet (The International Puppet Theatre Museum),a sister organization to the Marionetteatern. 1974 Meschke made his first visit to Asia. This was a turning-point in his view of theatre. He has often returned to perform plays from the Marionetteatern, to study, to direct, to lecture and lead workshops. Michael Meschke's life has been distinguished by an internationalism that also characterized the Marionetteatern. Even before he had founded a theatre he had built a network of contacts and sources of inspiration that included Wilhelm Furtwängler, Jean Vilar, Gérard Philipe, Marcel Marceau, Henry Miller, Hans Leygraf, Margareta Niculescu, Sven-Erik Bäck and Birgit Åkeson. Later sources of inspiration have included Sture Linnér, Peter Oskarson, Jack Lang, Kinnosuke Takeda, Enrico Baj, Joan Baixas, György Ligeti and Krzysztof Penderecki. He has been deeply involved with the international puppet-theatre organization UNIMA, serving as a member of its executive committee for twenty-two years, as chairman of its Third World Commission, and as Vice-President, co-founder and chairman of UNIMA-Sweden. His internationalism has led the Marionetteatern to tour the world to an extent unmatched by any other Swedish theatre. It has also inspired domestic activities that have included puppet-theatre festivals, guest performances and teaching visiting students from abroad. He has founded schools in Åbo in Finland and Stockholm and gave courses at Ecole supérieure nationale des arts de la marionnette, in Charleville-Mézières, France. 1999 Meschke handed over the running of the Marionetteatern to Helena Nilsson (Nilsson-Alvarez). 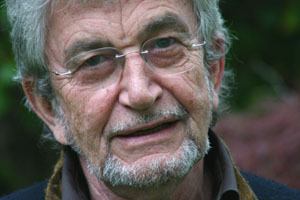 As Professor in Mask- and Puppet Theatre at Sweden's Dramatic Institute he led its programme in puppet theatre until 2002. He has written a number of books and contributed to publications outside Sweden. He has a special interest in traditions under threat including, for example, those in Burma. He continues to promote cultural exchange between Europe and Asia. This has included work at Thammasat University in Bangkok, Thailand. by Marcel Marceau: "Meschke's mime is close to my understanding of puppet theatre: the play is dominated by a visual imagination where even objects are alive." by Richard Hoogland in Teatertidningen in 1999: "The Marionetteatern has been one of the most important centres of Sweden's theatrical life despite the fact that it has most often been confined to small locales without showy banners." by Jack Lang, former French Minister of Culture: "He has cut across all genres, gliding successfully from mime to film-making, the founding of a theatre, museums and institutions, never a dilettante, always an impassioned and demanding explorer." by himself in 1998: "For me it has been impossible to separate what is private and what is theatre, everything has been woven together in my life."